I started eliminating gluten from my diet last fall. Being Italian, this was not an easy task. (Fortunately, though, my mother has adopted a similar diet, so we swap recipes for modified versions of the pastry, bread, and pasta dishes that are so near and dear to our culture). I’m certainly not one who is easily swayed by fad diets–my mantra is always moderation–but the truth is that I’ve never felt healthier. One of the biggest challenges to living gluten-free is finding grocery stores and restaurants that cater to these dietary restrictions. (The other challenge is willpower). Some places are more GF-friendly that others. I’ve found that Italy is a pretty welcoming country for gluten-free folk–for example, many pizzerie serve farro or kamut pizza, and the government offers stipends to celiacs so that they can afford to purchase produtti senza glutine. Prague, on the other hand, is much more challenging–though I’ve managed to scout out some good grocery stores and even a restaurant that serves gluten-free versions of traditional Czech dishes. Last weekend, I traveled to Paris for a mini-vacation. Before I left, I frantically searched for information about gluten-free bakeries, knowing full well that four days in a city known for its delectable–and to me, forbidden–pastries would drive me to madness. Luckily, I stumbled across a place called Helmut Newcake, the only 100% gluten-free bakery in Paris. 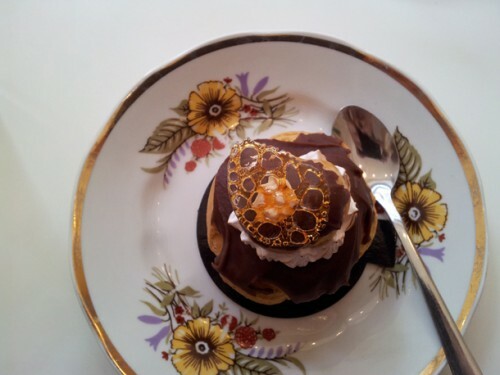 I visited Helmut Newcake for a long, leisurely lunch. The bakery is located in the 10th arrondisement near the historic Saint-Louis hospital and the scenic Canal Saint Martin. 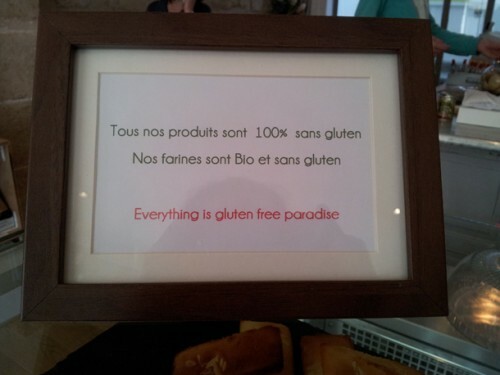 Signs proudly announce that you’ve entered a gluten-free paradise. The bakery is decorated simply, yet tastefully. 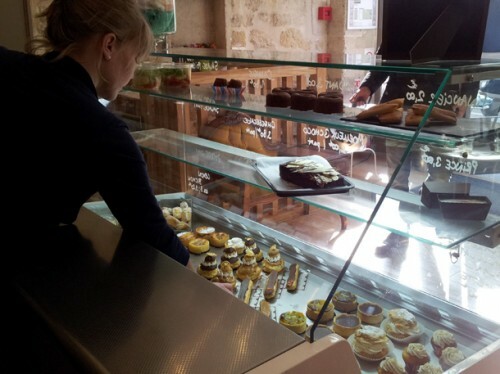 A glass case displays a varied collection of mouthwatering, freshly baked desserts: cheesecake, cupcakes, lemon bichons, chocolate moelleux, financiers, canelés, and religueses, just to name a few. 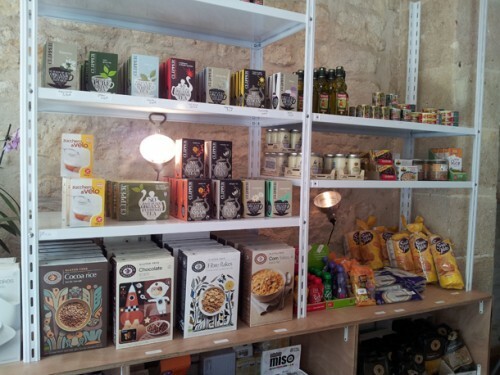 Along one wall are shelves of packaged gluten-free food products, including cereal, pasta, flour, miso, and soba noodles. 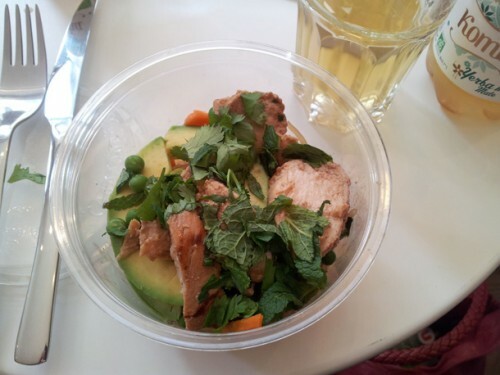 I started by ordering a Thai chicken salad with avocado and glass noodles, washed down with a bottle of organic kombucha. The salad was quite yummy. During the week, Helmut Newcake doesn’t over a wide selection of savory foods, but on Sunday mornings they serve full brunch. The hardest part was deciding which dessert to try. After a lengthly period of deliberation, I finally settled on a chocolate religuese. If I hadn’t known any better, I never would have suspected that it was gluten free. It didn’t taste like a half-hearted imitation product; it was just an utterly delicious and decadent pastry. I finally understood why one reviewer wrote that Helmut Newcake has brought French celiacs to tears. I asked the owners what inspired them to open a gluten-free bakery in Paris. Francois’ wife, Marie Tagliaferro, was working as a pastry chef in a patisserie. In time, however, she was diagnosed with a gluten allergy. So, she decided to start her own bakery, offering gluten-free remixes of French pastries. This trailblazing attitude appears to have paid off; there was a constant flow of of people stopping by to pick up desserts the entire time that I was there. It seems that Helmut Newcake has carved out a happy niche in Paris’ dining scene. This entry was posted in Cities, Taste and tagged bakery, cafes, camilla, food, france, GF, gluten-free, organic, paris, pastries, restaurants, taste. What a great post! I’m going to Paris next week and have about 6 patisseries on my list but will have to check out Helmut’s as well. Great. Thank for the post. But please be aware that both farro and kamut are actually containing big amounts of gluten! Thanks for your comment, Paul. Yes, farro and kamut do contain gluten, although people with less severe gluten intolerances (i.e., not celiacs) are often able to consume these grains without negative symptoms. This sounds awesome. I need to make a gluten-free trip to Paris!